Eugene’s latest model Town Car limo is elegance on wheels. Five door “bride’s door” design for easy entrance/exit. A wedding and Quinceañera limo favorite. 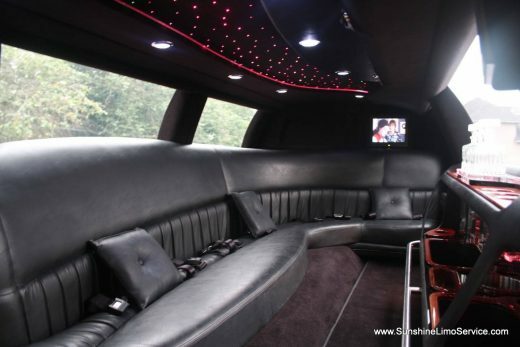 Great limo for an Oregon wine tour, night on the town or any occasion. We have 2 of these matching white limos and 1 black one available to serve you. Very nice fiber optics, walnut bar with level 3 sound system, MP3 player/IPOD/Bluetooth ready, 2 flat panel led TVs, and extra door to make getting in and out a breeze. One of the nicest Town Car limos in Oregon. Great choice for a bachelorette party limo or wedding limousine. Non smoking $139 for a single hour, $100 per hour for 2 hours or more (plus tip and fuel surcharge). Watch our YouTube video of our 10 passenger Lincoln Town Car limo!